PAGE, Ariz. — The Interior Department released Friday its final environmental impact statement for a long-term experimental and management plan for Glen Canyon Dam operations in northern Arizona. 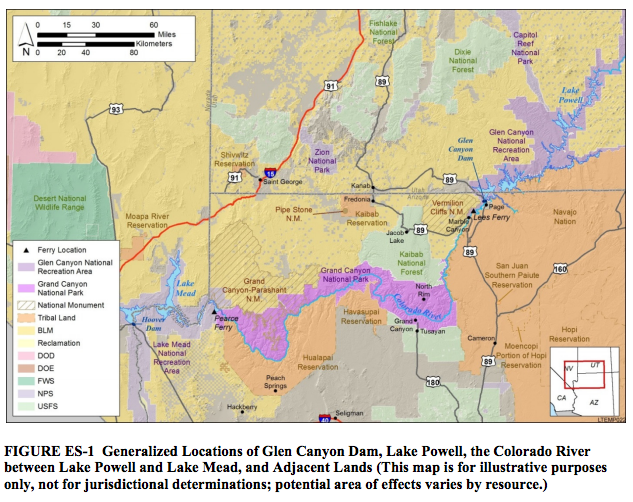 The long-term management plan will provide a framework for adaptively managing Glen Canyon Dam over the next 20 years, the department’s news release said, with the goal of creating certainty and predictability for water and power users while protecting environmental and cultural resources in Grand Canyon National Park and the Colorado River ecosystem. The final impact statement presents a thorough analysis of complex river processes and interests and identifies a preferred alternative that ensures Glen Canyon Dam will continue to meet its purposes while improving downstream resources and recreational experiences. This is the first environmental impact statement for Glen Canyon Dam since 1995 and it marks an ongoing focus on balancing project purposes with natural and cultural resources protection. Friday’s release culminates an open and transparent process based on the best-available science, extensive public involvement and active collaboration with stakeholders, cooperating agencies and traditionally associated tribes, the Interior Department’s news release said. Interior’s Bureau of Reclamation and National Park Service jointly led the final statement completion in coordination with 15 cooperating agencies — including three federal and six nonfederal agencies and six American Indian tribes. In addition to addressing suggestions, concerns and comments from those cooperating agencies, the final statement fully considered all comments received during a 122-day public review and comment period that ended May 9. The final statement was prepared in accordance with the National Environmental Policy Act of 1969 and evaluated potential environmental impacts of seven alternatives — including one no-action alternative that would continue operation as guided by the previous 1996 record of decision. The final environmental impact statement team identified a preferred alternative that improves river system conditions and minimizes adverse impacts to downstream natural, recreational and cultural resources while meeting obligations for water delivery and hydroelectric power generation. The preferred alternative continues high-flow experiments linked to adaptive triggers such as sediment and hydrology and includes fish conservation and management tools to improve fisheries and the aquatic food base. The long-term management plan and the final environmental impact statement support the ongoing focus of the Glen Canyon Dam Adaptive Management Program, which includes a diverse group of 25 river system stakeholders. The final impact statement team received letters expressing support for the preferred alternative from the seven Colorado River Basin states (Arizona, California, Colorado, Utah, Nevada, New Mexico, and Wyoming), National Parks Conservation Association, Western Area Power Administration, Navajo Nation, river rafting guides and many members of the public. The final environmental impact statement notice of availability was published in the Federal Register Friday. The Interior Department will issue a final record of decision following a minimum 30-day public review period. The record of decision will select the alternative that will be implemented and discuss all factors leading to that decision. Government website for the long-term experimental management plan, including links to the plan and final environmental impact statement, among other things. If you wish to obtain a compact disk copy of the plan and impact statement, use the LTEMP FEIS Order Form.